A new addition to the family can mean a lot of extra clutter! Toys, clothes, strollers…there are so many items that come with parenthood and as your baby grows out of them, the clutter can begin to pile up. While donating or giving away baby gear is a great option for decluttering, you may not want to get rid of everything so soon. If you’re planning to have another baby—or even leaving the option open—holding onto baby clothes, toys and supplies is a great idea. Additionally, some things may have sentimental value or you may be waiting to hand them down to the right person. It is common to hold onto clothing, but clothing can be vulnerable to pests such as mice. Washing the clothing with an unscented laundry detergent before you store it is the best way to protect it. You need to make it as easy on yourself as possible to relocate items in the future. 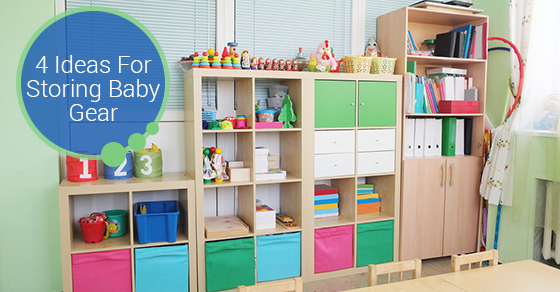 Sort items into storage bins—plastic storage bins are best—and label everything clearly. Sorting options include sorting by age/size, season or gender. You don’t want to declutter your home only to clutter up your storage space. Look at each item carefully to evaluate its reuse or hand-me-down potential. If you think you’ll never use something again, donate it or give it away. While plastic materials are pretty resistant to environmental changes, the same cannot be said for wood, metal and cloth. Wood is prone to warping or moisture damage if there are big temperature swings or excessive moisture. Metal, too, can warp in some climates. Clothing can be vulnerable to mold and mildew. Keep your items safe by choosing a climate controlled storage unit. At Jiffy Storage, we offer storage units that are climate-controlled, highly secure, fire and flood monitored, and computer controlled. Whether you are looking for long or short-term storage, and whatever size of unit, we are here for your storage needs! Contact us today to discuss which option is best for you.